There are a variety of things that I enjoy about a book like this one. For starters, I find the works of Mr. Martin to be creative, gritty, and engaging. He has been an author of some renown for years, and a huge bestseller with his Song of Fire & Ice series, a monumental effort that will someday hopefully enjoy a conclusion. 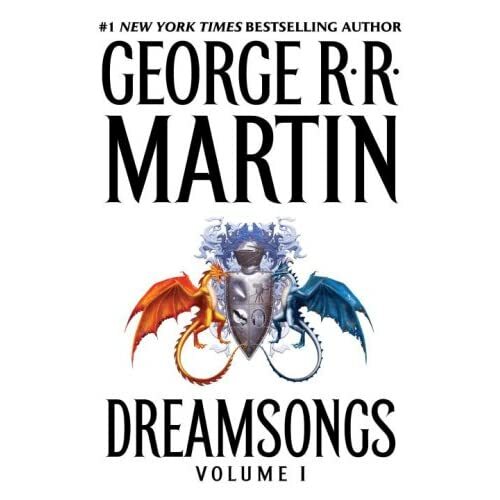 Of interest to my grandfather when he noticed this book was the coat of arms between the dragons, bearing four images, which I explained represent the four major genres or aspects of Mr. Martin's career that he focuses on in Dreamsongs. They are, roughly, fantasy, sci-fi, horror, and film/screen writings. In addition to his stories, which are grouped together thematicaly by time period and genre, he also gives an autobiography which introduces each section and offers insight into his past and inspirations for his stories. We find out about the importance of comics and sci-fi magazines, sort of an underground movement at the time but Martin's big break into authorhood. You can observe from story to story (especially at first) how his development as a writer came along (exponentially, as I see it). He writes of rejections, relationships, school, conventions, making friends with the right people and taking opportunities that arose. And, not so humbly, lets us know which of his short stories have been Hugo/Nebula winners and how successful various pieces were. And I was okay with that. Now, I happen to enjoy the short story format. It is much like a sampler of chocolates (a bit like Forrest, hmm?). Instead of being immersed in just one world, one flavor, one color for however long a novel lasts me, I get to experience numerous worlds, interesting characters, and creepy situations. Instead of being up at 2 a.m. and unable to set the book down, and knowing I have 150 pages to go, short stories let me read as much as I want, when I want, without the horrible compulsion to destroy my body in an 8-hour reading coma. And finally, I find there is a certain something to respect in an author that manages to efficiently cram an entire story into a novella or short story. As you would expect with a sampler, there are good stories and not-so-good ones. Overall, though, I was pleased with what I read. The earliest stories were weaker; perhaps the prose was too direct and full of adjectives, or maybe the plots were a bit too simplistic, I don't know. But George got very good - "A Song for Lya" was very emotionally intense and heartbreaking, "Sandkings" was exciting and suspenseful, using the unknown very well, and "The Pear-Shaped Man" was just disturbing without the slightest violence or gore, just up there messing with your head. So it's not all fantasy. Nor is it always sci-fi, or horror. Many times, he mixes the latter with one of the former to great effect. The good news for me is there is another volume to read, because I could do with some more of George R. R. Martin while I wait in futility for a new novel to appear. If you like this kind of collection or are interested in the genres mentioned above, I have no reservations about recommending Dreamsongs. If you are curious to see whether you would like Mr. Martin's writing but daunted by getting involved in an epic series, this could be a good place to start as well. I'm not yet sold on short story collections. I love short stories, but prefer them one at a time, especially if each one feels complete on its own. It's really hard for me to get through a whole collection. On the other hand, it's probably a good way to get to know someone's writing style, like you said. Do you think there's a difference between Martin's shorts and his novels? Is one better than the other? That's a good question. I haven't really noticed a difference, possibly because I don't analyze that closely. But in his novels (the ones I've read anyway), each chapter is told from the perspective of a different character, and in a way, each chapter could be considered its own short story, with the obvious exception that they don't wrap up all the loose ends. Another difference is in his short stories there is one, perhaps two things going on, and his novels can have 5or more simultaneous plotlines. a timely review. i was at the library last Saturday, trying to talk myself into reading Martin's first book in the SoF&I series. i looked at a Steven Erikson (sp?) fantasy series as well. b.) they both seemed like never-ending series. Robert Jordan suckered me into that sort of thing with The Wheel Of Time. i'm not gonna get duped again. So i went with an Amanda recommendation instead. Which of my recommendations? I've been reading practically all YA fiction this year. The Eyre Affair. That looked too good to pass up. it's next in line (it has to be, since it's a library book), right after i finish a book that Lula recommended. oh, and word-check is somanot. sounds like an anti-drug motto. Ooh, the Eyre Affair. That one's just the first of a big long series, too, so I'm not sure that's taking a different route from the other two you mentioned. Maybe it's shorter, but it's so topsy-turvy that it might not feel like it. So which one ended up being your favorite? There were alot of really good ones; I don't know that I could pick one in particular as my fav. If Martin does finish it, SoF&I is worth getting into, if dark, depressing and R-rated books don't bother you. I happen to love how he dishes out misfortune so evenly; he'll get you to feel a bias, but he treats 'em all impartially, good & bad. So much misery you could choke on it, but it's good somehow. Real, just from a pessimist's perspective. And it's not the length of the series, just that they aren't finished, right? Otherwise, Pratchett, come on. You got me curious, though. Who is Steven Erikson (sp?). Almost everything I read is an epic series (all fantasy must be at least a trilogy or editors will reject books as per policy). I'll see about him. Probably A Song for Lya just edged out Sandkings. Both got my emotions involved, but Lya just seemed more poignant. the Steven Erikson book is Memories Of Ice, and i saw a reveiw of it over at the fiftybooksproject blog. the reviewer praised it as epic fantasy, and said it was his 2nd-most favorite series; Martin's SoF&I being his favorite. and you're right - the thing that drove me away from both was the probability that the story would never end. the 900-1000 pages is only a problem if the book turns out to be a dud. i'm OCD, so i have to finish every book i start. but i've read nothing but good things about GRRM, so the "dudability odds" of SoF&I seem low. and a dark, depressing, R-rated fantasy series sounds good to me. i wonder if he was influence by Norse mythology. the Aesir (Odin, Thor, etc.) may be gods, but they know the prophecies say that in the end, they lose. that sort of end-times view is unique (AFAIK) among past-&-present world religions. everybody else preaches that they're on the winning side.